There is growing recognition across the globe that the inexorable decline in the state of nature may have profound consequences for the lives of people and their economies through the loss of the natural resources and the ecological services they provide. There is the equally compelling call for biodiversity to be conserved for its intrinsic and irreplaceable value to mankind too. In response to this threat, world leaders at the COP6 of the UN Convention on Biological Diversity (CBD), and the Johannesburg World Summit on Sustainable Development, agreed to achieve by 2010 a significant reduction of the current rate of biodiversity loss at the global, regional and national level as a contribution to poverty alleviation and to the benefit of all life on Earth. Likewise, the UN's Millennium Development Goal 7 aims to ensure environmental sustainability by integrating the principles of sustainable development into country policies and programmes and thus reverse loss of environmental resources. The framework provided by such ambitions has been influential in guiding and streamlining policy responses across the globe. This process, however, critically relies on the availability of headline indicators to understand and report on progress towards the target. This scheme aims at developing such an indicator for Uganda based on monitoring data on common and widespread birds across many landscapes both inside and outside protected areas, where people and wildlife co-exist. In this context, ‘common birds’ refers to species whose population trends, when aggregated together, can be used to indicate trends in the condition of the wider environment. In general, these will be commoner, widespread, more detectable, species, and most will probably be placed in the Least Concern (LC) category of the IUCN Red List. However, in many cases, it is also appropriate to include some threatened species, generally the ones with larger populations undergoing rapid declines. Birds can act as excellent barometers, or indicators, of trends in the state of wildlife and nature, and thus of the sustainability of human use of landscapes and resources. Birds occur in nearly all habitats, often reflect trends in other animals and plants, and are sensitive to environmental change. Their populations can faithfully reflect wider-scale changes in nature and biodiversity, and thus be used to report upon sustainability of lifestyles. Indicators based upon common bird populations can communicate vital information on habitat changes, driven by both direct anthropogenic habitat loss and modification, and indirect effects, including the impact of climate change. Environmental degradation of this kind may have profound consequences for the lives of people by reducing natural resources and the ecosystem services upon which they depend. Importantly, birds, and particularly those species that are common and widespread, have a real connection with people and their lives. Common bird indicators are especially useful in showing change in the overall condition of ecosystems, which is difficult and expensive to measure directly. More so, we may be facing declines of common bird populations without our knowledge, yet such declines would indicate a fundamental flaw in the way we treat our environment and thus influence the way we behave. In order to allow synthesis and collation of trend data at a site, national, and ultimately regional, level, bird population monitoring needs to be conducted in a standardised and coordinated way. A Bird Population Monitoring formally the Common Bird Monitoring (CBM) scheme in this context refers to a generic monitoring approach covering a wide suite of common and widespread land bird species. Data collected will, in time, be used to produce an aggregated population trend as an indicator of the general condition of natural habitats in Uganda. The Bird Population Monitoring scheme, coordinated by NatureUganda works with local and regional partner organisations with the intention of building local and regional capacity for Bird Population Monitoring and engagement with local/regional policy forums. The scheme aims for long-term sustainability by engaging volunteer observers in simple and rewarding bird monitoring with clear objectives and conservation value, and with high quality support for participants (e.g. good training, educational materials and appropriate reporting of results and feedback). As well as providing an efficient and sustainable basis for data collection, following the successful models developed elsewhere, this will increase capacity for other environmental monitoring schemes, raise awareness of sustainable living and build support for conservation action for birds and biodiversity. As well as collecting data that will contribute to the development of bird population trends at a national level, the scheme will undoubtedly have relationships with the ongoing programmes of collaborating partners. This may include synthesis with IBA monitoring and threatened species work, or complimenting existing ranger-based monitoring activities. CBM data will therefore have tangible benefits to partner organisations at a site-based level. Monitoring common and widespread birds, as well as those that are more threatened will at the very least allow site-based bird species lists to be maintained, and in time, site-based bird population trends may be developed. On a more general level, site managers may choose to publicise their active participation in the national BPM scheme in order to inform visitors of environmental and conservation activities of the site. International visitors from Europe and America in particular, who are more likely to already be familiar with the principles of CBM may be interested to learn that activities of this nature are being conducted at a site. 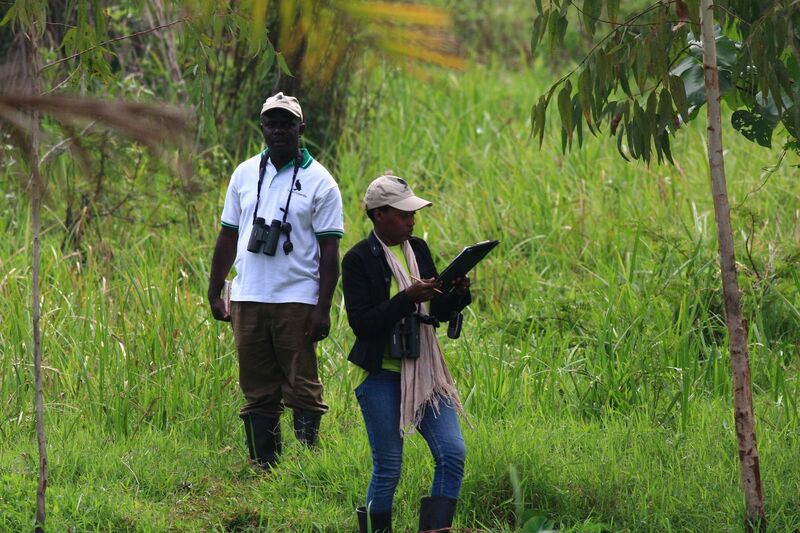 The NatureUganda Bird Population Monitoring (BPM) scheme bases its surveys on the recognized method of ‘line transects’. This involves counting birds along a predefined route within each survey area. Although a regular approach to placement of the route is ideal, in reality certain land uses (roads, watercourses etc.) may dictate, or limit access, resulting in modifications to the ideal routes. Indeed, straight lines can be very difficult to establish in many instances. To simplify re-location of the same transect on all subsequent visits, little used footpaths or small roads that are only very occasionally used by vehicles (less than once per hour) are useful to delineate routes. These have the added advantage that surveyors spend less time looking at the ground to avoid tripping over, and more time identifying and counting birds. This is the approach used by the NatureUganda BPM scheme. The counting technique involves walking along a transect and recording individuals of all species of birds (seen or heard) on either side of the observer. The transect length is approximately 2km, divided into 10 x 200m sections. Bird counts at each transect take place twice a year (Jan/Mar and Jun/Aug). The data collected is recorded on forms provided and collected by the coordinator based at NatureUganda. This data is later entered into the WorldBirds database from which summary reports can be obtained. The BPM scheme is done by volunteers mainly researchers and interested birds based in their homes or work places all over the country where they set up transects they monitor biannually. The scheme started by training the volunteers in the agreed methods. These volunteers were later advised to encourage other birders to join the teams and they were also trained in BPM methods.